The king of fruit the Mango is here in town from Ratnagiri and Konkan areas. The Alphonso (Hapus) is now being sold at Rs. 400 to 700 for a 2 dozen box. 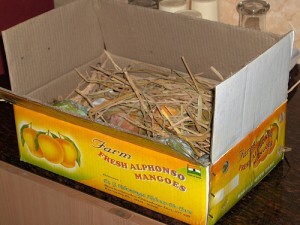 A week ago when the first lot was received the prices were about Rs.1000 to 1200 for a 2 dozen box. The prices will come down again once as more and more stocks start coming in. The fruit market is adrift with other fruits as well like grapes, watermelons, sweet lime, oranges.